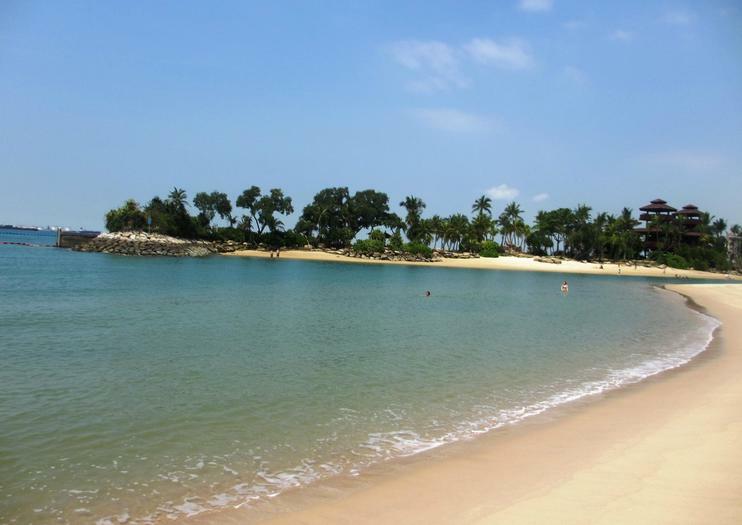 Sentosa Island is home to nearly 2 miles (3.2 kilometers) of white sandy beaches, Siloso, Palawan and Tanjong Beaches. Of the three, Palawan Beach is most geared toward families. This long stretch of sand features a fountain playground, shower facilities, a hawker center selling inexpensive food, themed islets for picnicking and a suspension bridge linking the beach with the Southernmost Point of Continental Asia. An amphitheater at Palawan Beach hosts the Animal and Bird Encounters, a series of reptile and bird displays included in the price of Sentosa admission. Lifeguards supervise Palawan Beach, making it a good swimming option for families with young children. Let your kids' imaginations run wild with admission to KidZania Singapore, an indoor interactive theme park at Sentosa's Palawan Beach. This child-geared activity center allows kids to engage in 'adult-type' professions that interest them, such as professional chef to police officer. Everything is sized to fit children, from tiny vehicles to a mini hospital, pizzeria and radio station. Kids use their own currency and develop real-life skills from completing tasks through reading the news and 'flying' airplanes. Both fun and educational, KidZania helps improve children's self-esteem. See Singapore at its most magical during a sunset dinner cruise that reveals waterfront sights illuminated by night. You’ll cruise along the river on a luxury tall boat and listen to live music throughout the journey. Plus, depending on your budget, you can choose between gold and platinum options: a platinum package comes with a 3-course meals and guarantees you upper-deck seats for the best views of the water, while a gold option includes buffet dinner. This sightseeing tour of Singapore is convenient for visitors to the Malaysian city of Johor Bahru who want to check out the neighboring city-state for a day. You’ll travel by private vehicle, so you won’t have to waste time sitting on buses or trains. As this is a private tour it is customizable to suit your needs and interests. Learn about Singapore’s diverse cultures, and experience both the glitzy urban and more chilled out, old-fashioned areas of the city. Island hop from Sentosa to the Southern Islands, home of Singapore’s richest reefs and unspoilt beaches. Take in the panoramic view of Singapore’s City or enjoy the quiet serenity of the Southern islands.This 7-10 km route is made for the fishing and adventure junkie. Paddle the distance and fight the currents as you make your way to the best fishing spots in Singapore. Heavy bottom fishes like groupers and snappers are commonly caught in the region and occasionally, some pelagic species like mackerel and queen fish.